I remember when health food stores were small, neighborhood businesses with a carefully selected inventory of supplements. These days, health food stores are massive! They contain all manner of pills, powders and potions manufactured to meet your health needs. It’s great to see natural health becoming more popular, but at the same time, the size of these stores also indicates that there are a great deal more products being created to capitalize on this new interest. You have to wonder if all of them are as beneficial as they claim to be. Among this wide array of products and synthetic supplements, spirulina stands tall as one of the natural, ultimate superfoods that’s truly as awesome as it’s cracked up to be. There’s no question about it, spirulina benefits your health in so many lasting ways. Here’s spirulina’s big little secret: hands down, it’s the most protein-rich food on the planet. Chief among spirulina benefits is the fact that it’s 60% protein and contains all of the essential fatty acids, including gamma linoleic acid or GLA. This is a particular highlight, because a number of recent studies have shown GLA to be effective at battling inflammation, especially when taken with an omega-3 supplement like cod liver oil. If you’re a vegetarian or vegan interested in getting some of your daily protein from spirulina, your best bet is the powder form. Typical 500mg servings of the tablet form contain 1g of protein, but 2 tbsp of the powder will give you a full 8g of protein to meet your daily needs. Added Bonus: One of the biggest spirulina health benefits is that it’s rich in nutrients, including B complex vitamins, beta-carotene, vitamin E, manganese, zinc, copper, iron, and selenium. You’ve probably heard of the importance of Omega-3. These wonderful fatty acids improve cardiovascular health, decrease the severity of autoimmune disorders, and may postpone cognitive decline. You can get Omega-3 from olive and coconut oil, avocados, homemade salad dressings and so on. However, if you’re looking to get Omega-3 without the extra calorie intake, spirulina is a perfect way to do just that thanks to it’s high Omega-3 content. Did You Know? Fish is touted as one of the world’s finest sources of Omega-3 fatty acids. Do you know why this is? It’s because fish get their omega 3’s from eating algae. By eating spirulina, you go straight to the source (and keep sustainable fishing a reality, too). A number of studies have shown that chlorophyll, the property that gives plants their green color, is extremely beneficial for detoxifying your system, especially when it comes to mercury and other metals. The rule of thumb is this: the greener the leaf, the more chlorophyll it contains. You have so many options when it comes to greens—arugula, spinach, kale, etc.—but one of the biggest spirulina benefits is that this algae is about as deep green as it gets. Just as chlorophyll gives life to plants, the chlorophyll content of spirulina penetrates deep into your body when consumed, repairing and regenerating you on a cellular level. Added Bonus: With high levels of essential fatty acid GLA (gamma linoleic acid), you’ll also be benefiting your skin. Blueberries are rightfully credited as being extremely rich in antioxidants, but a recent independent study found that the Oxygen Radical Absorbance Capacity (ORAC) score of spirulina was more than 24,000 – four times that of blueberries. In a 2008 study, participants who consumed spirulina 8g/day for 16 weeks lowered total cholesterol and significantly increased lipid profiles, immune variables, and antioxidant capacity. In other words, spirulina benefits your body by increasing its ability to repair itself. The dairy industry would have you believe that milk is the best source of calcium on the market. This infuriates me, because dairy has repeatedly been proven to be an unimpressive source of dietary calcium. What’s worse, studies have linked dairy consumption to higher levels of prostate cancer. It’s simply unacceptable to lead people to believe this, as calcium is essential to building and maintaining healthy bones. What we need are proven sources of calcium; spirulina is a great one. The brilliant blue-green algae is 26 times higher in calcium content by weight than whole milk. A 2 tablespoon serving of spirulina powder contains a whopping 24mg of calcium. This wonderful superfood delivers yet again. Your body needs iron to function, and two of the best whole foods sources for this mineral are leafy greens and meat. If you’re a vegan, or you’re not particularly fond of greens, it’s important to supplement your iron intake in some way. Spirulina can do the trick. 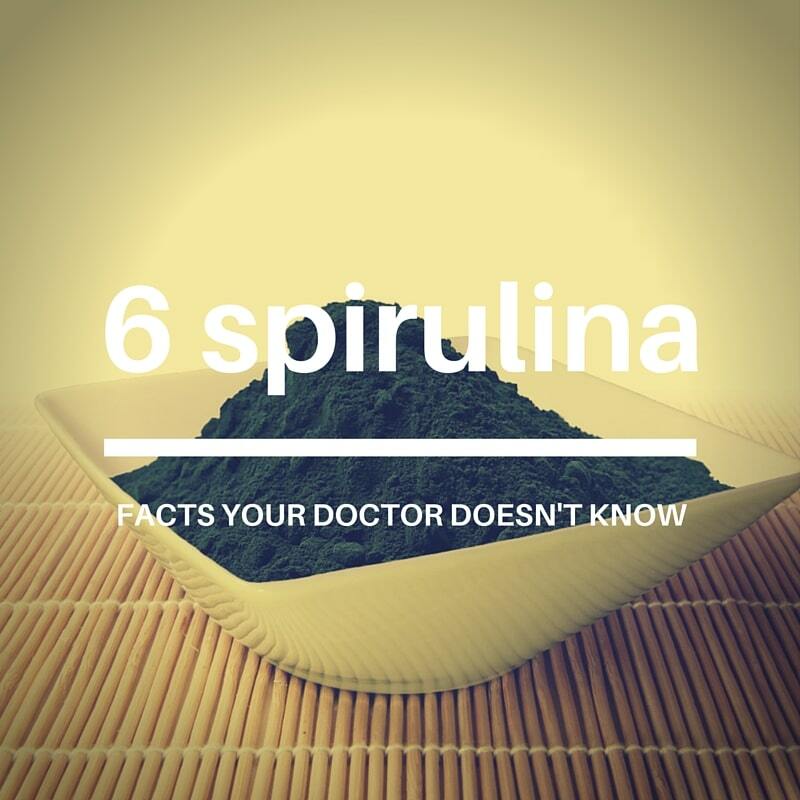 Spirulina has 2300% more iron than spinach–that’s 50 times the amount! Keep in mind that these amounts are per calorie and not per serving. So, one serving of spirulina does not have 50x the amount of one serving of spinach. However, a small amount of spirulina still packs serious punch. It’s unrealistic to make spirulina your primary source of protein, iron, or calcium. It goes down best in small doses and is expensive when compared pound-for-pound with other protein sources. However, as a supplementary option, spirulina is absolutely worth adding to your diet. Before you start consuming spirulina, please keep in mind that the source of your spirulina matters. If it’s not harvested responsibly, it can be full of toxic chemicals, causing severe stomach pain, nausea, and vomiting. The best way to ensure you’re getting quality spirulina is to look for an organically sourced product with independent third party lab verification. You’ll want to find spirulina that is labeled both toxin and radiation-free. It should contain no iodine or bromine. If that sounds too complex, let me make it simple for you: For years, I searched for the best daily greens powder to recommend to my clients. It had to be organic, GMO-free, and great-tasting. None of the powders I found passed my test. With this, my wife and I hit the kitchen and started working with superfood combinations, eventually launching our own line of Energy Greens powder. Maybe I’m biased, but I’ll just say it: this is the best-tasting greens on the market. That says a lot, because admittedly, spirulina tastes like the ponds from which it came. However, once it’s mixed in with our blend of 8 superfoods, you won’t even know you’re drinking algae. This stuff is absolutely delicious. You can add a scoop of Energy Greens to ice water, smoothies, a glass of juice, even these greens powder recipes and not even realize you’re getting a gigantic dose of spirulina benefits from whatever you’re chugging. Energy Greens also contains other must-have superfoods like goji berry powder, maca, barley grass, and chlorella powder. It’s all mixed together with cinnamon and vanilla and is truly incredible. If you have a particularly sensitive palate, then you can also get your spirulina in tablet form, and take spirulina supplements twice per day. Keep in mind, however, that capsules are less potent. Optimally, you should aim for two 500mg doses or a total of 1-2 tablespoons daily of the powder.